The court found the law unconstitutional because it would have violated a section of the constitution pledging that state employees' earned benefits "shall not be diminished or impaired." The justices said that the writing has been on the wall since a 1917 report commissioned by the General Assembly suggested that the state's pensions systems were "moving toward a crisis." But a deal wasn't struck until former Democratic Gov. Pat Quinn and Democratic lawmakers finally overcame opposition from union allies, amid warnings that it might not survive a court challenge. The plan rejected by the justices was designed to whittle down the monstrous shortfall, deemed the nation's worst government-employee pension crisis. The plan — which would have covered teachers except in Chicago, state employees, members of the General Assembly and university employees — was estimated to reduce the state's unfunded liability by $145 billion over 30 years. Gov. Bruce Rauner addressed Chicago's City Council at a historic meeting Wednesday and urged city leaders to consider the rest of the state, not just the city, when making decisions. NBC Chicago's Carol Marin reports. The milestone law would have erased the guaranteed 3 percent annual compounded cost-of-living adjustment increase added in 1989, replacing it with a formula that gave the increases on a portion of benefits, depending on years of service. Some would have had the option of freezing their pensions and contributing to a 401(k)-style plan like many in private business. After a Sangamon County Circuit Court Judge in November ruled that the law violated the state constitution, both Quinn and Rauner urged the high court to decide the matter quickly. On Friday, Rauner called the court's decision "fair and right." He's advocated for a different pension overhaul proposal he says would save the state $2.2 billion in the fiscal year starting in July. His plan would moving all state workers to a less-generous plan that lawmakers approved for people hired after 2011. Others could choose to join a 401(k)-style account. 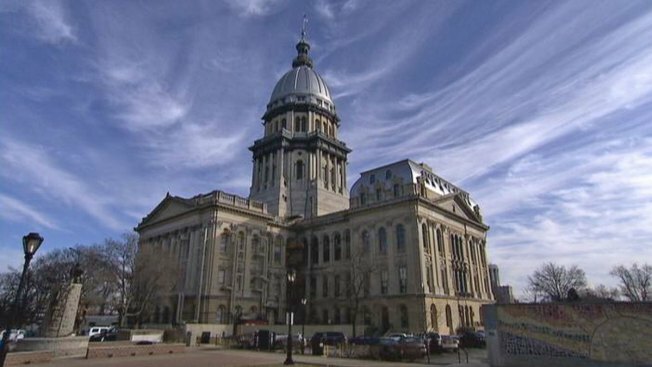 Critics of Rauner's plan, including leaders of the Democrat-led Legislature, have suggested that that savings shouldn't be counted upon, as the proposal might also face constitutional challenges. Rauner also wants to pass a constitutional amendment that would allow the state to seek changes to future pension benefits without affecting benefits already earned. That could take some time. By law, the Democratic-led legislature must first approve a constitutional change by a three-fifths vote, a move which must then be ratified by Illinois voters at the next general election in November, 2016. "Time is of the essence, but working too fast and therefore getting it wrong is not good time management," said state Sen. Daniel Biss, an Evanston Democrat and a leading negotiator of the original plan. "There are a lot of limitations placed on the Legislature by this ruling. We need to think carefully about what the options are, what rules can be utilized and design something accordingly."